Coleslaw is one of those dishes that evaded my understanding for a long time. A pile of shredded cabbage drenched (sopping, in fact) in mayonnaise, flavorless, textureless, and mushy? Mm, sign me up. No wait, keep that as far away from me as possible. No, I don’t want it on the side of my sandwich, or my fried chicken, or anywhere in my immediate or not-so-immediate vicinity. Quinoa is back, baby. I hadn’t cooked it in a few months, as I had made myself a little sick of it by making the curried quinoa recipe I wrote about back in September. But I recently cleaned up the shelf where I store my bulk grains and moved some of the ones I hadn’t used in a while up to the front to encourage me to cook with them. Encouraged I was, but also stymied. The curry dish had been my first real quinoa success, and while I still wasn’t ready to eat any more of it, I didn’t have any other ideas. So I turned to our good friend the internet and began scouring for ideas. In addition to discovering the existence of a quinoa-focused cookbook called Quinoa the Supergrain, I found a number of recipes focused around tomatoes and black beans. Notice that the name of this post is not “Pasta with End of Summer Vegetables,” but rather “End of Summer Vegetables, with Pasta.” That’s because the emphasis here is on the veggies — the beautiful beautiful veggies that herald the end of summer, and the end of fresh vibrantly colored vegetables so delightful and delicious that they can, and should, be eaten raw. 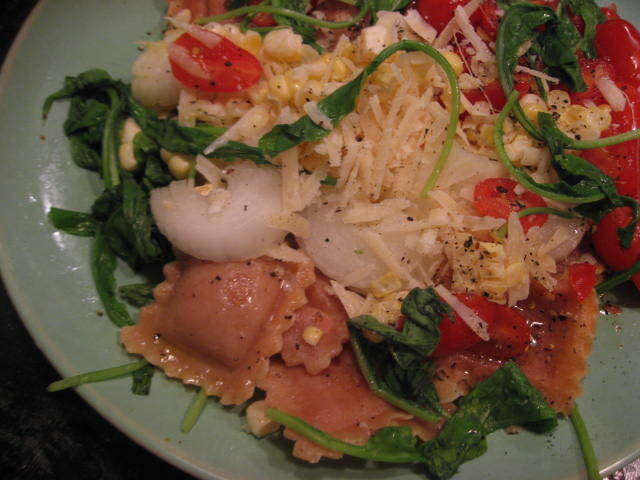 As Claire pointed out to me yesterday, we’ve been on a pretty salad-focused kick here at Food Junta, a lot of said salads involving tomatoes, corn, warming, or some combination thereof. But this salad was so good, I had to share it. Repetitiveness be damned. Though I’m pretty sure this is a common-ish dish out there in the world, this particular salad was totally unplanned and just a result of what I happened to have kicking around in my kitchen. 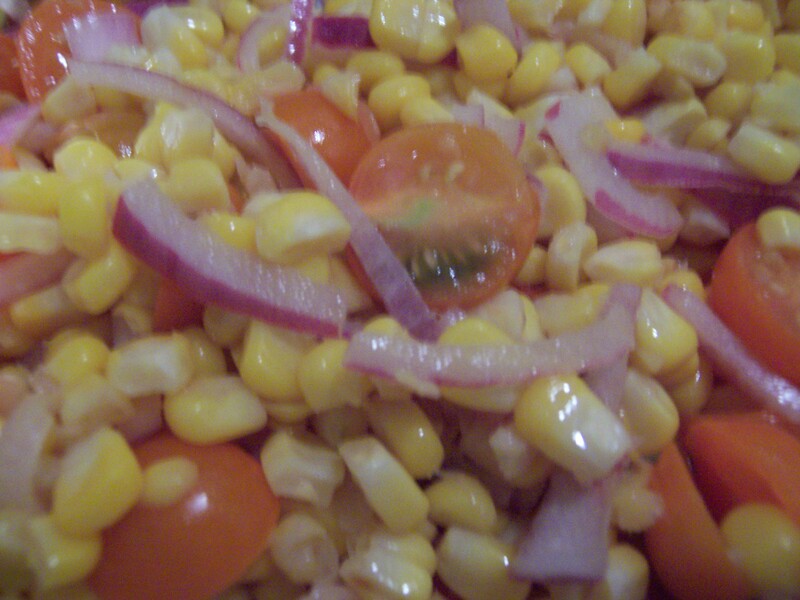 I had had the corn in my crisper for a little too long (6 days or so) and needed to do something with it, I usually have a red onion or two around for salads, and I had the sungolds around because I love sungolds. I love potato salad, but not that gross, mayonnaise-laden stuff that typically passes for potato salad around these parts (the U.S. being these parts). Sometimes that mayonnaise-y stuff can be really good, but more often than not, it’s basically disgusting. Tastes disgusting, looks disgusting, IS disgusting, as Coolio might say.